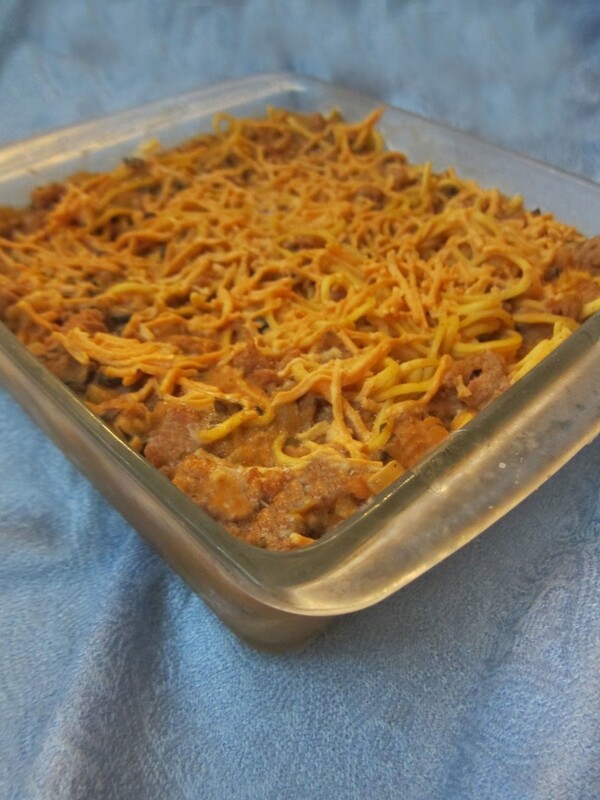 Casseroles don’t photograph well. My apologies. Nevertheless, this recipe was so good I decided to just throw caution to the wind and post the picture anyway. 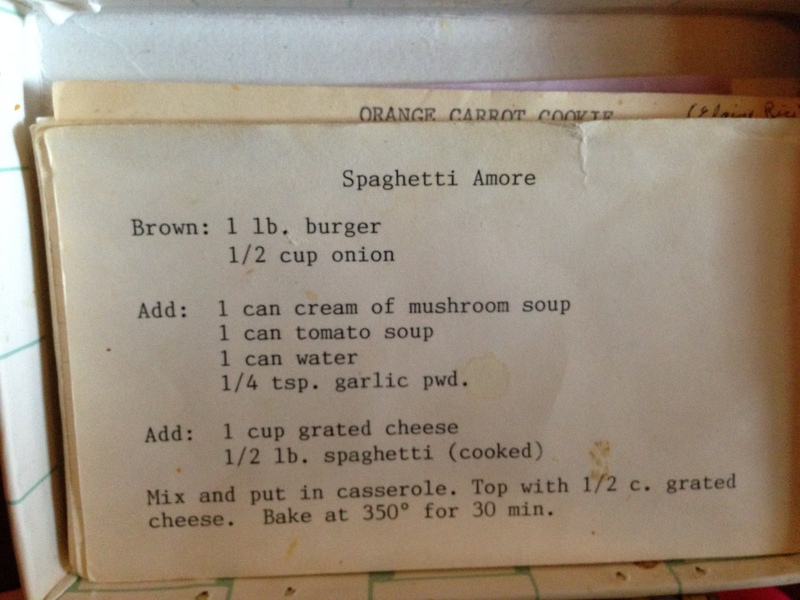 The dish is Spaghetti Amore. This was one dish that was an absolute staple in our house when I was growing up. When my angel mother found a recipe that all of her six kids would eat, who can blame her for making it so often? 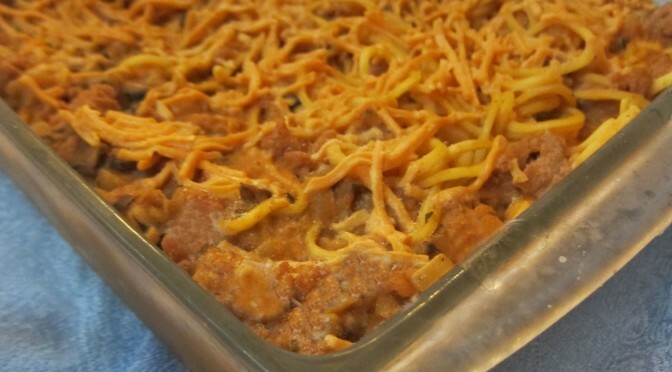 It was easy, and cheesy, and was synonymous with comfort food. I remember making it for my roommates once, and right after we were done, one roommate said she felt like playing board games like she would do with her family after a Sunday dinner. Yes, it is good. Yes, it is easy. But is it healthy? Well, I would have to say the answer is, no. Ground beef, condensed cream of mushroom soup, condensed tomato soup, grated cheese, and spaghetti would likely not qualify as ‘healthy’. Condensed soup that contains wonderful things such as high fructose corn syrup, potassium chloride, monosodium glutamate (MSG), soy protein, yeast extract, and the always ambiguous ‘flavoring’ and ‘modified food starch’. And let’s not even talk about the sodium levels. So now the task was to make this dish so it is less processed, more healthy, and also more allergen-friendly. Swapping out the mushroom soup for real mushrooms, and swapping out the tomato soup for tomato paste and tomato sauce were a delicious start. Thickening with rice flour instead of ‘modified food starch’ or wheat flour was the next step. I also substituted turkey for the beef, and just swapped out the cheese for a dairy-free cheese. I have to confess, I was surprised at how well this matched the original. Cook pasta according to package directions, cooking at the low end of the suggested cooking time. Drain (You want it to be al dente because it will continue to cook in the oven. For example, the pasta I used said to cook 6-9 minutes, so I only cooked the pasta for 6 minutes). While pasta is cooking, cook ground turkey in large pot until completely cooked through. Remove from pot and set aside in a separate bowl. In the same pot, heat margarine over medium heat. Add onions, mushrooms, salt, pepper, and thyme. Stir to combine and then cover. Cook for about 5 minutes until mushrooms release their liquid. Uncover and cook until water is almost all evaporated. Add garlic and tomato paste. Stir until fragrant, about 30 seconds. Stir in rice flour and cook for one minute, making sure the mushrooms and onions are coated with the flour. Slowly stir in chicken broth, scraping bottom of pot to get any brown bits from the bottom of the pot. Add tomato sauce and coconut milk. Stir until thickened, about 3-5 minutes. Remove from heat and stir in 3/4 cup of cheese until combined. Stir in cooked turkey, and cooked pasta. Pour into 9x13 dish and top with remaining cheese. Bake in preheated oven for 30 minutes. Let cool for about 10 minutes before serving. This dish freezes well. Cool slightly on counter first, then cover with foil and cool completely in fridge before putting it in the freezer. Cook, covered, in 350 degree oven for about 60-75 minutes, or until heated through and bubbling. If a total vegan dish is desired, just double the amount of mushrooms. I love taking these old family standards, and recipes of my grandmothers and figuring out how to make them more allergy friendly. If you have one you’d like me to take a stab at, let me know!